Please note that there may be laws (state / Federal / country) against capturing or even (technically) touching a wild bird without a permit. If in doubt, it is best to contact a local wildlife rehabilitation center. 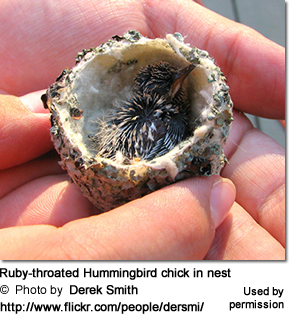 If you come across hummingbird chicks in the nest that don't appear to be in distress (injured or in immediate danger), it is best to leave them alone. Often, the chick's mother is near the nest waiting for you to leave so that she can tend to her young. Your presence may stop her from feeding her chicks. Hungry chicks specifically are relentlessly calling their mother and this will also attract predators. If you have cats, you may want to keep them indoors, if there is a bird nest in the garden that the cat could easily reach. If you hear them call for extended period without seeing their mother around, keep an eye on them. Something may have happened to their mother and they may need your help. Due to their high metabolism, they will starve to death very quickly. If mom isn't seen within an hour or two (for smaller chicks 1 hour, older chicks 2 hours), please contact a wildlife rehabilitation center or bird vet. Finding a chick on the ground. Sometimes, the chicks may fall out of the nest, but that doesn't mean that they have been abandoned. First verify that the chick is not injured (check for blood and broken limps - gently extend the legs / wings. The chick should be able to pull them back into proper position. If not, they may be broken). Do not worry about touching the chicks. The mother won't abandon them because of "human smell." This is an old wives tale that has long been proven wrong. 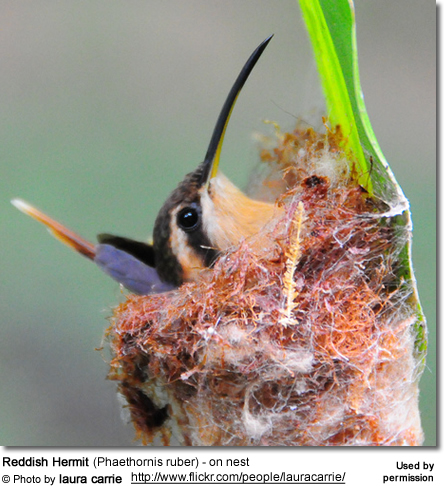 Feathered-but-flightless hummingbird nestlings often jump out of the nest if orphaned. Therefore, watch to make sure mother returns within 1 to 2 hours; if not, call a wildlife rehabilitator. They may also fall out if the nest is too small to accommodate all chicks. If this is the case, construct a make-shift nest and place all chicks into it. If you have trouble attaching the new nest, you may need to tie or tape it to the branch. Sometimes hungry nestlings will jump out of their nest if their mother isn't coming back to feed them. They may indeed be orphans. So it is important to keep an eye on them. Remain at a safe distance as your presence would stop her from approaching the nest. If the mother isn't coming back within 1 hour, contact your local wildlife rehabilitation center. Look around for the nest and, if you find it, place the chick gently back into the nest. If the chick is fully feathered (likely fledgling), place it on an interior branch of a shrub, where it is hidden and, therefore, somewhat protected from predators. Its mother will be able to locate it by its calls. If the chick is not fully feathered (hatchling or nestling), then you need to provide a make-shift nest. You couldn't just place it on the ground - ants and other predators would soon kill it. The chicks will call their mom when they are hungry and she will find them. Discreetly keep an eye on the nest to make sure mom is coming back to care for the chick(s). If you don't see the mother come back within one hour, contact a wildlife rehabilitation center (first choice) or vet (second choice) near you. If the nestling is well-feathered and can perch, but can't fly: Put it back in the nest if you can. Again, keep a lookout for the mother, and if she doesn't appear, or if the baby won't stay in the nest, call a wildlife rehabilitator. Fledglings: Leave older, fully feathered chicks that are apparently learning to fly alone. Unlike nestlings, which will usually remain still when you approach them and pick them up, fledglings will make short flights to get away from them. The best you can do for them is to keep children, dogs and cats away until it flies off. However, if it is relentlessly calling its absent mother, it may be an orphan in need of assistance. So look out for mother hummingbird to come around. If she doesn't within a couple of hours, then immediately call a wildlife rehabilitation center. If the chick is injured or you know that it is orphaned your help will be necessary for its survival. Note, only the hummingbird mother raises the chick - there is no helpful dad. So if something happened to her, there will be no other parent to help out. Lift the injured or orphaned hummingbird along with the material it is sitting on, Place it in a small box (with holes in the top lid) or plastic margarine cup lined with soft tissue or paper towel (not cloth as their feet could get entangled in it). Provide the bird with a low heat source, such as placing it under a heat lamp (available in pet stores for reptile use specifically) about 12 cm or 5 inches away from the bulb. Be careful not to overheat the bird. If it starts open-mouth breathing or keeps its neck outstretched, it is too hot. Overheating is dangerous and could kill it. A good temperature range is usually 85 - 90 degree Fahrenheit or 29 - 32 degrees Celsius for the younger chicks. If fully feathered, a little less is okay. Again, always check for overheating. If they feel cold to the touch, there may not be enough warmth to keep them alive. 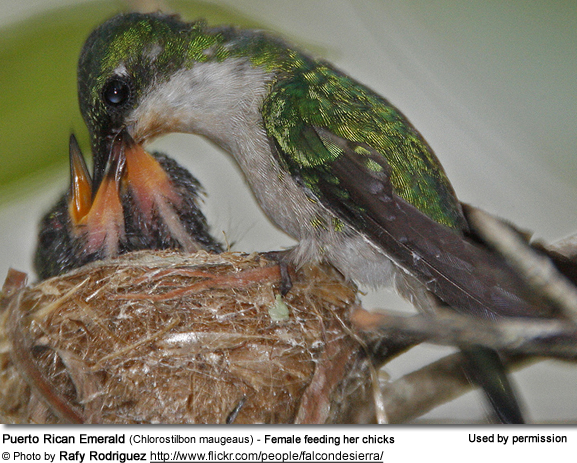 Feeding hummingbird chicks is difficult as their natural diet consists of partially-digested insects which the mother pushes down the chick's throats with her long bill directly into their stomachs. A trained wildlife rehabilitator greatly increases the chick's chance of survival. Wildlife Rehabilitators are usually listed in your Yellow Pages / Telephone Directory. Or call your local animal shelter, zoo, parks department, or conservation agent for instructions (re. emergency care, recommendation for an experienced wildlife rehabilitator, etc.). If you find a nest on the ground with unbroken eggs and/or chicks still in it, also put it back where it formerly was (if known). 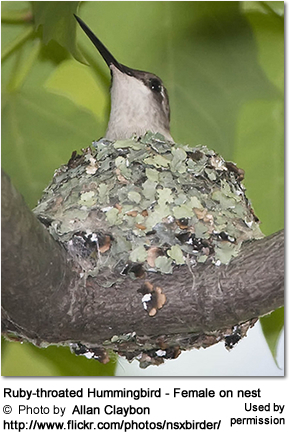 If you have trouble attaching it to its original location, you may need to tie or tape a small box (remove top) to the branch and place the nest inside. If you are not completely sure, where the nest originally was - don't worry. The chicks will call their mom when they are hungry and she will find them. You may not be the only one who noticed the chick. Predators such as larger birds - birds of prey, black birds (crows), jays, roadrunners - cats and even mice all prey on those chicks and may also be watching or they may want to investigate what drew your attention after you are gone. You don't want to draw attention to yourself or the nest / chicks. Continue to watch the chick or the nest from a safe distance -- the use of binoculars may be helpful. It is important to wash your hands after handling any wild animal. Ideally, you should also wash your hands BEFORE handling any chicks. Remember, their immune system is very weak at this point. Take a small box or clean margarine tub with holes at the bottom to allow any water to drain. Line it with dry plant material, make a cup in the middle with your fist and place the chicks into it. Alternatively, if you found the original nest but it is damaged, place it into the container. If you are not completely sure, where the nest originally was - don't worry. Place it close to the area where you found the chick) on an interior branch of a shrub. Some tropical species attach their nests to the undersides of large leaves (please refer to below image.). If necessary, tie or tape the nest to a branch or leaf (as applicable) to keep it in place. Should I take down my feeder in the fall and, if so, when?